In a small bowl, lightly whisk the egg yolks and set aside. Add the cream and half and half and sugar to a saucepan. Split the vanilla bean and scrape the insides in. Then toss in the pod, for good measure. Heat just to a simmer. Add about 1/4 cup of the hot liquid to the egg yolks, whisking furiously to temper the yolks. Add another 1/2 cup, continuing to whisk. Then, scrape the egg mixture into the pot with the rest of the liquid is. Cook, stirring constantly at a low simmer until the mixture thickens to a custard consistency, thick enough to thickly coat the back of a spoon. Strain the custard into a bowl. Stir in the raspberry puree until completely mixed. Refrigerate at least 4 hours (I like to leave mine overnight). Then, churn in an ice cream machine according to your machine’s directions, transfer to a container and freeze. Use to assemble ice cream sandwiches with the cookies, as directed below. Spread the coconut on a baking sheet. Bake in a 325F oven until just lightly browned, about 5 minutes. Remove from the oven and cool completely. In the bowl of a standing mixer fitted with the paddle attachment, cream together the butter and the sugar until light and fluffy. Then beat in the salt and lemon juice. Beat in the flour in two additions, adding the coconut and lemon zest with the second addition. Then beat just until the dough pulls away from the sides of the bowl and forms almost a single mass. Gather the dough together, flatten it into a disc, wrap it in plastic wrap and chill for at least an hour. Preheat your oven to 325F. On a lightly floured surface, roll the dough out to about a quarter inch thickness. Use a 2 inch round cookie cutter to cut circles. Transfer the cookies to parchment lined baking sheets. Gather the remaining dough together, roll it out again and cut more circles. Repeat as needed to cut all the dough (you may have some odd scraps at the end – bake them and snack on them), using as little flour as possible all the while. Bake the cookies for about 16-20 minutes (rotating each baking sheet halfway through the baking time), or until they are golden brown. Keeo the sheets with uncooked cookies on them in the refrigerator while they wait to bake. Allow the cookies to cool on the baking sheet for about 3 minutes, then transfer them to a wire rack and allow them to cool completely. 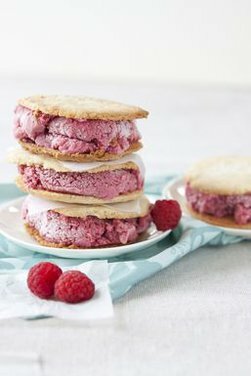 To assemble the ice cream sandwiches, let the raspberry ice cream soften slightly. Place a scoop of ice cream on top of a cookie. Top with another cookie and press down gently to make a sandwich. Wrap with plastic wrap and place in the freezer. Repeat until you have used up all of the cookie pairs (or all of the ice cream, whichever comes first, but they were fairly well matched). Let the sandwiches freeze until they are hardened. Then serve. They will also keep wrapped and stored in the freezer (put them in a box of some sort to protect them) for a while, just waiting for when you need them. yum! wished i had an ice cream maker!